"Gluten" is a blanket term for storage proteins that are found in grains, such as gliadin in wheat. Gluten is also contained in triticale, barley, rye and oats and is harmful for people with celiac disease, causing debilitating gastrointestinal problems and malnutrition. 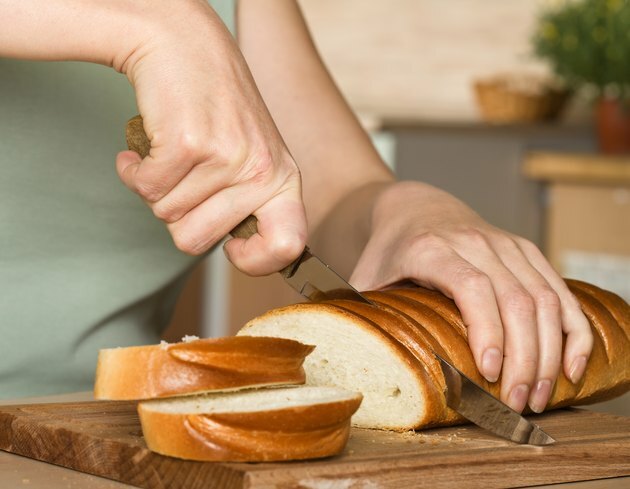 Conventional white breads contain gluten, but gluten-free white breads are available and appropriate for those with celiac disease and gluten sensitivity. Most conventional white breads made from grain flour naturally contain gluten. Gluten imparts sensory benefits such as elasticity, airiness and texture to baked goods. The gluten content of North American wheat products is higher than foods made from European wheat. It has been estimated that 75 percent of total protein in wheat flour is gluten and that most commercially prepared breads contain 11 percent to 16 percent protein per weight. In general, unless the packaging indicates otherwise, white bread contains substantial gluten. With the rise in diagnosed cases of celiac disease and interest in gluten-free diets, consumers may be interested in gluten-free white breads. In the case of commercial white bread, "gluten-free" means that the product contains less than 20 milligrams of gluten per kilogram. Therefore, some gluten may still be present but poses minimal risk to celiac disease sufferers compared to conventional breads. Look for breads labeled "gluten-free" in the health food aisles of grocery stores. Celiac Support Association: What Is Celiac Disease? Journal of Agriculture and Food Chemistry: Can an Increase in Celiac Disease Be Attributed to an Increase in the Gluten Content of Wheat as a Consequence of Wheat Breeding? American Journal of Clinical Nutrition: The Million-Dollar Question: Is ‘‘Gluten-Free’’ Food Safe for Patients With Celiac Disease? Is Optimum Nutrition Protein Powder 100% Gold Standard Gluten-Free?